Paramus, and can this be? I'm at the IKEA in Paramus, New Jersey. I buy another basic "Billy" bookcase, having once again run out of space for all those volumes I honestly, honestly mean to read before I'd ever dream of handing over my credit card once again to Patrick in Arcade, our local bookstore, I promise, and this time I really mean it. Trundle the 86-pound package into the parking lot and feel a back muscle go as I stuff it single-handedly into the back of the Sierra. But I struggle back into the building again, feeling the call of a Swedish cinnamon bun before I hit Route 4 back to the George Washington Bridge. And I pass a display that shows the bookcase I thought I bought, on sale for $49.99. I check my receipt. I paid $69.99. Now my theory is that these are the same sizes in metric, and the rounding is just a little different, because IKEA has no concept of adjusting its manufacturing standards for its biggest market. Yeah, perhaps it's a petulant Swedish attempt to drag the US into the twentieth century, but if the shame of being the only nation other than Myanmar not to have adopted the metric system hasn't worked, I don't think the land of ABBA's going to make a dent in our resolve. These bookcases are made in Canada for God's sake, they're used to dealing with us. So I go back to the car, unload again (noticing as I do that the package says the contents are actually 31 1/2 x 79 1/2), take it to the same customer service representative who credits my card with $69.99, still treating me as if I'm the idiot, go back into the store, get the identical product from a different spot in the racks, buy it for $20 less (a whopping 28% discount), and struggle back to the car. The customer is always right, he just doesn't always get to feel that way. P.S. Lodged my cinnamon bun on the front seat of the car while I loaded the replacement bookcase, my back now really hurting. The bun flipped over, but I righted it fairly quickly. So which would you be more concerned about? A patch of sticky icing on the front seat? Or upholstery fibers on the bun? It works for nursery rhymes, too. Or they'll come home . . ."
Oh no, it's another of those literary mash-ups. "During the whole of a dull, dark, and soundless day in the autumn of the year, when the clouds hung oppressively low in the heavens, I had been passing alone, on horseback, through a singularly dreary tract of country; and at length found myself, as the shades of the evening drew on, within view of the melancholy Spot of Eeyore. I know not how it was -- but, with the first glimpse of the place, a sense of Insufferable Gloom pervaded my spirit." Seven billion people in the world. And none of them reading my blog. Overpopulation. It's a problem. Too many people sharing too few resources, too few jobs, too small a space. And this little piggy went "wee, wee, wee, wee" all the way home. Five toes, five piggies. Seems logical. Or is it? Is this just another example of overstaffing and redundancy? Perhaps a classic time and motion study would reveal greater efficiencies. This little piggy went to market, this little piggy stayed home. Fine, the actions are mutually exclusive, it takes two. This little piggy had roast beef. A third piggy? Not necessarily. Either of the first two piggies could have had the roast beef. The piggy who went to market may have paused in the middle of a busy morning’s shopping to have lunch. Can you picture him, sitting in a small bistro just off the market square, bags of groceries stuffed under the table, tucking into a plate of rare sirloin, stuffed chestnuts, and a truffle or two (hold the chipolatas)? But maybe it wasn't a food market. Maybe our gadabout piggy has headed for the nearest cybercafe to day-trade in financial stocks, while munching on a pastrami Reuben. 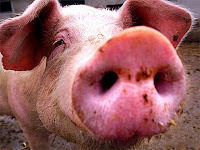 Or maybe commodities are more his line -- after all, who else would know so much about pork belly futures? 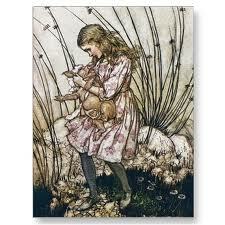 Or perhaps it was our first piggy who had the roast beef. Alone, vacuuming in the apartment, having divided the weekly chores with his fellow-swine, he gets a little peckish around lunchtime and cuts a cold slice or two from the Sunday joint to make himself a sandwich. Either way, no need yet for a third piggy. This little piggy had none. Again, still no need to posit a new piggy. We’ve already learned that only one of the first two piggies ate. Clearly, the piggy left crying ‘Where’s the beef?" is the other. And this little piggy went "wee, wee, wee, wee" all the way home. Is there any doubt that this is the same piggy who went to market, now returning to home base? The only mystery is what caused his pathetic cries of "wee." And here I think we have a valuable clue to the identity of the piggy who noshed on the roast beef. Consider the two scenarios. Either the piggy who went to market had the roast beef or he didn’t. Is the weeing all the way home, therefore, the result of indigestion after eating a suspect piece London broil, or is it hunger pangs? Which of these would cause him to wee so liberally? Personally, I vote for hunger pangs. And thus we can flesh the story out . 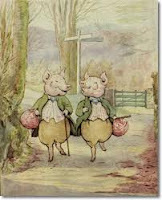 . .
Two piggies, both alike in dignity, share a household – perhaps the very same brick house that withstood the huffing of the Big Bad Wolf in another tale. "What shall we do today?" cries one, stretching and tumbling out of bed on a Monday morning. "We’re out of everything," declares the other, no doubt the more enterprising of the two, glaring balefully into the empty refrigerator. "I must go to the market or we’ll be dining on three olives and a jar of expired mayo." "Ah, stay home," cajoles his laconic comrade. "I've got a new DVD -- 'Sows Gone Wild.' We’ve got some leftover roast beef from the weekend. I’ll curry it for lunch"
"No, no, I must go. Frankly, Lionel, I hunger for adventure, for the wide-open spaces, for the world. Farewell, dear brother. The future beckons." And thus he heads off to the Piggly Wiggly. His brother shrugs and opens a bag of pork scratchings. Flash forward a few days later. A hammering on the door in the middle of a wild and rainswept night. The first piggy, brown bathrobe flung hastily over pajamas, nervously lifting the edge of the curtain. His cries of joy as he wrenches the front door open to admit the haggard, staggering form of his beloved brother, weak from hunger, and barely able to articulate. "We . . . ," he gasps, "we . . ."
"Yes," croons his brother, helping him to bed. "We can have roast beef." Is it too far-fetched to see the parable lurking here? When you strip the rhyme to its bare minimum, surely this is the tale of The Prodigal Son, the one brother seeking his fortune in the big city, with the tawdry temptations of its so-called "market." But a market for what? Ruined, demoralized, high on the hog, will he be forced to sell his body to the night, to the treacle-voiced tempters who murmur "bacon cheeseburger," to the greasy faced women who hunger for his loins? He’d rather live like a pig. There is only one possible conclusion. This rhyme was composed for religious purposes by somebody with only two toes. Probably a born-again sloth. Next time on Population Control Theater, how they could have made the Harry Potter movies with three actors and a false mustache.